This isn’t the first robot lighting I’ve seen, however, I do believe it’s my new favorite. It’s my new favorite for several reasons really. One of which being the robot is just the base and the lightbulb itself can be up to a 100W bulb. Which means this isn’t another novelty light that only puts off a faint glow. Don’t get me wrong, novelty lights are still fun, but I’m happy to see this cute and still functional light. One of its absolute best features is that it won’t break the bank to own this geek-friendly robot. 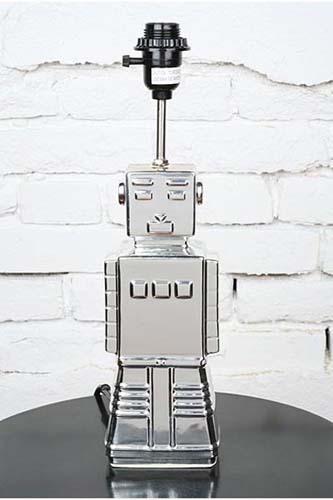 The robot is actually made of ceramic then finished off with a metallic silver coating over top. It also features foam rubber at the base to make it a bit more stable. Although it’s hard to say if it’s entirely kid-proof, but it’ll at least help keep them from knocking it over. He measures 4.5” wide by 17” tall by 2.5” in diameter. Like I said, the price is the biggest perk about this little robot. He’s being sold for $30. Which hopefully means that he’s still good quality, but either way you can pick him up on Urban Outfitters.